In 1957, Richard Altick's groundbreaking work The English Common Reader transformed the study of book history. Putting readers at the centre of literary culture, Altick anticipated-and helped produce-fifty years of scholarly inquiry into the ways and means by which the Victorians read. Now, A Return to the Common Reader asks what Altick's concept of the 'common reader' actually means in the wake of a half-century of research. Digging deep into unusual and eclectic archives and hitherto-overlooked sources, its authors give new understanding to the masses of newly literate readers who picked up books in the Victorian period. They find readers in prisons, in the barracks, and around the world, and they remind us of the power of those forgotten readers to find forbidden texts, shape new markets, and drive the production of new reading material across a century. 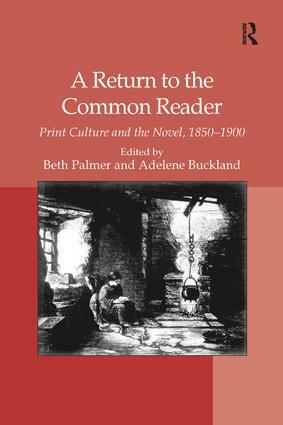 Inspired and informed by Altick's seminal work, A Return to the Common Reader is a cutting-edge collection which dramatically reconfigures our understanding of the ordinary Victorian readers whose efforts and choices changed our literary culture forever. Contents: Foreword; Preface; Introduction, Beth Palmer and Adelene Buckland; Part 1 Publishers, Authors, Critics, Readers: The advantage of fiction: the novel and the 'success' of the Victorian periodical, Laurel Brake; Dorothy's literature class: late-Victorian women autodidacts and penny fiction weeklies, Kate MacDonald; Ouida; how conceptions of the popular reader contributed to the making of a popular novelist, Jane Jordan; 'Those who idle over novels': Victorian critics and post-romantic readers, Debra Gettelman; 'Gossip' and 'twaddle': 19th-century common readers make sense of Jane Austen, Katie Halsey. Part 2 Scenes of Reading: Reading in gaol, Jenny Hartley; Attempts to (re)shape common reading habits: Bible reading on the 19th-century convict ship, Rosalind Crone; 'Quite incapable of appreciating books written for educated readers': the mid-19th-century British soldier, Sharon Murphy; 'A journey round the bookshelves': reading in the Royal Colonial Institute, Beth Palmer; Fiction and the Australian reading public, 1888-1914, Tim Dolin; Selected works cited; Index. Beth Palmer is Lecturer in English Literature at the University of Surrey, UK. Adelene Buckland is Lecturer in Literature at the University of East Anglia, UK.